A South Yorkshire-based marketing specialist with 15 years in-house experience within the professional service and manufacturing sectors has launched his own marketing consultancy to deliver project management, sales support and public relations to companies across the region. Supported by a £500 grant from the UK Steel Enterprise (UKSE) Kickstart Fund, Chartered marketing professional Brendan Hall established Hallmark Branding Ltd in response to demand from small and medium sized businesses looking for strategic marketing advice. Over the past eight months he has established a strong client base including Sheffield-based recruitment consultancy Glu Recruit alongside office design and fit-out company Dale Office Interiors, and has also launched local business and lifestyle publication Wave Magazine which is distributed to residents of the new Waverley development in Rotherham. The funding from UKSE, a subsidiary of Tata Steel tasked with assisting the economic regeneration of communities affected by changes in the steel industry, allowed Brendan to invest in advertising and marketing collateral including a logo, website and business cards. Tools he says were ‘vital’ in promoting the new business to the potential clients across the region. 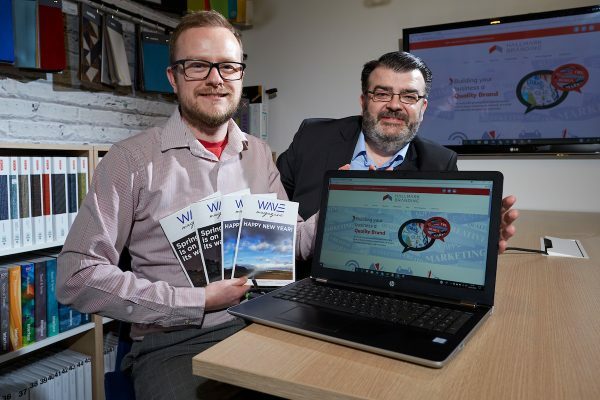 Commenting on the investment, Brendan said: “Having always wanted to set up on my own, the funding from UK Steel Enterprise allowed me to invest in website design and further marketing collateral which are key components in terms of raising awareness of my services and offering. Working with a range of clients spanning a variety of professional services across South Yorkshire and North Derbyshire, Brendan hopes to increase his client base before expanding further afield to work with SMEs and owner-led businesses across the wider Yorkshire region. Alan Stanley, Regional Executive at UK Steel Enterprise commented: “Brendan provides support through his offering of marketing consultancy and project management services. A subsidiary of Tata Steel, UK Steel Enterprise also provides equity and loan finance up to £1M to growing companies. Established businesses in need of growth finance can contact the UK Steel Enterprise team on 0800 915 1188.